By doing this you will overload your muscles, maximising the amount of damage they sustain. When a muscle is damaged due to resistance training, new muscle cells replace the damaged cells and grow bigger and stronger in an effort to prevent further damage from a similar stress in the future. The more experienced lifter you are, the less muscle damage you sustain because your muscle fibres are stronger. Because of this you will need to train very heavy and with high-intensity techniques during this phase. Then, you will fully overload your muscles and ensure muscle damage and growth. You are going to follow a five day split, which you will train shoulders and all other major muscle groups. Training delts just once a week will optimise muscle recovery from the intense workouts, allowing time for new muscle cells to replace the old ones and proliferate. This Will Be Your Phase One Split. In phase one, train delts alone for one day. For all other muscle groups, continue your training programme. Limit the use of high intensity training techniques for the other muscle groups, this will focus your body’s efforts on maximising delt muscle growth. Your shoulder workout begins with two sets of seated barbell shoulder presses, these include (negative/forced reps). To do this, select a weight you can press for six reps.
Take a slow, five second cadence to lower the weight from overhead to your upper chest. If you have a partner help you, or you are on your own, lift the bar back to the start (with no more force than needed to help you press the weight back up). 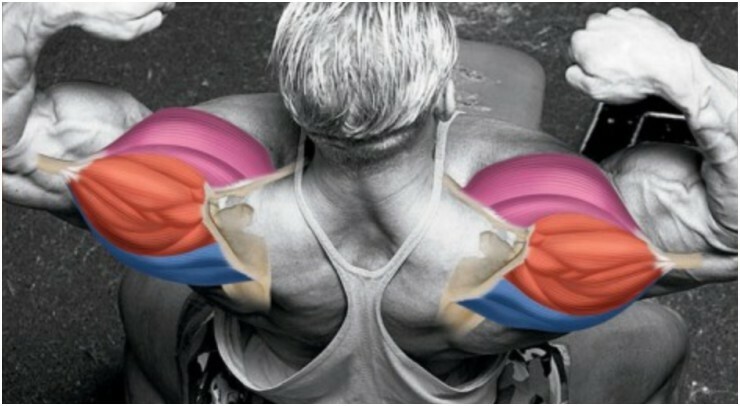 Then perform two more sets of shoulder presses using a technique known as extended sets, this allows you to continue an exercise for more reps by switching to a better bio-mechanical position. Do one set of seated presses for six reps to just short of failure, super-setting that with standing barbell shoulder presses for as many reps as you can. Use the same weight as for the seated presses. Stand and perform standing shoulder presses, these are easier than seated because you can use your legs to help you explode the weight up as your delts fatigue. Choose a weight with which you can perform eight reps of seated laterals. Stop just before reaching failure, then immediately stand up and continue the set until failure, using a slight bounce in your legs and body to help you complete more reps.
After reaching failure, perform two (negative/forced reps) as described in the pressing exercise. Finish three sets in this manner. Perform the first set of each exercise as a straight set, doing eight reps to failure. Second set, reach failure, then reduce the weight by 20-30% and immediately crank out as many reps as possible. Two drop sets after reaching failure by reducing the original weight by 20-30% and immediately performing as many reps as possible, then reducing the weight again by 20-30% and going to failure. Use this workout every Thursday for four weeks. Each week, you should attempt to increase all weights used on all exercises by 5 kg. In phase two, you will still follow a five day split, but you’ll hit your delts in a twice weekly training session. One will be a light and short workout following chest, the other, heavier and more intense, will fall later in the week, after a full day of rest from the gym. In the first phase, we focused on muscle growth. After four weeks of training this way, your muscle fibres will be resistant to further damage, so now we can switch our focus to training that will maximise growth by another mechanism, spurring an increase in activity of specific genes that prompt protein synthesis in muscle cells. Since muscle is made of protein, the more protein it builds, or synthesis, the bigger the muscle become. Promoting gene activity by training your delts every three or four days keeps protein synthesis at higher levels. The first delt workout of the week is scheduled for Monday, following chest. It’s comprised of cable exercises. The cables’ line of pull allows you to keep constant tension on the deltoid muscle throughout the entire range of motion, helping target more muscle fibres within the delts. The workout starts with two arm standing cable lateral raises to hit the middle delts, and finishes with incline bench bent cable lateral raises for the rear delts. Do four sets, resting one minute between sets. On the first set, choose a weight with which you can get 20 reps.
For the second set, increase the weight so you’re done at 15 reps.
Increase the weight again and do 12 reps for set three. Finish with one final increase to max out at 10 reps. Depending on how fatigued you get and how fast your muscles can recover in just one minute, you may find that you don’t need to increase the weights to hit those lower rep ranges in each successive set, fatigue alone may prevent you from being able to do more than the target number of reps. The second workout of the week is for Friday, following a full day of rest on Thursday, this will ensure that your energy levels are up for the intensity required. The session consists of pre exhaust supserset training, which involves performing one set of an isolation exercise, such as dumbbell lateral raises, followed immediately by one set of a multi joint exercise, such as seated dumbbell shoulder presses. 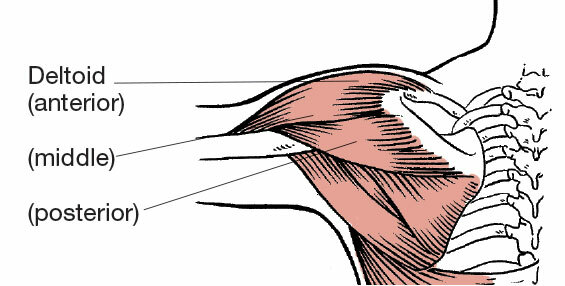 This technique fatigues the targeted muscle, in this case the middle delt head, so that during the multi joint exercise the targeted muscle becomes the weak link. This ensures that you fail on the multi joint exercise when the targeted muscle fails and not the assistance muscle. Superset seated dumbbell lateral raises with seated dumbbell shoulder presses. Do standing dumbbell lateral raises with Smith machine behind-the-neck presses. Finish with seated alternating dumbbell front raises and incline-bench bent dumbbell lateral raises for a well- rounded (pun intended) delt routine that targets all three heads. * After the sixth rep, perform three negative/forced reps.
† Use the same weight for both exercises. ‡ Use the same weight for both exercises; when you reach failure on the standing laterals, perform two negative/forced reps.
** On the second set, do one drop set; on the third set, do two drop sets.